Monasterevin AFC are defeated by Naas AFC White. 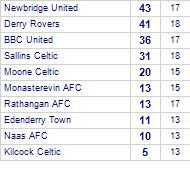 Naas AFC White has yet to be beaten in this competition, having won every game. Monasterevin AFC claim victory against Naas United. Monasterevin AFC has yet to be beaten in this competition, having won every game. Athy Town share points with Monasterevin AFC. Monasterevin AFC has yet to win in this competition. Rathangan AFC take all points from Monasterevin AFC. 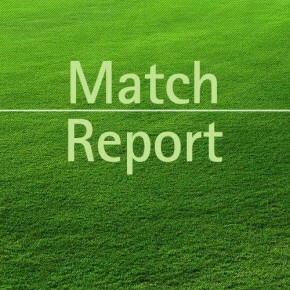 Moone Celtic suffer defeat to Monasterevin AFC. Moone Celtic has yet to win in this competition. Monasterevin AFC share spoils with Prosperous United. Monasterevin AFC has yet to be beaten in this competition, having won 2 out of its last 3 games. Monasterevin AFC despatched by Clane United. Clane United has yet to be beaten in this competition, having won every game. Prosperous United share honours with Monasterevin AFC. Prosperous United has yet to win in this competition. Monasterevin AFC take spoils against Rathangan AFC. Moone Celtic are defeated by Monasterevin AFC. Sallins Celtic despatched by Monasterevin AFC. Derry Rovers are defeated by Monasterevin AFC. Monasterevin AFC take all points from Arlington AFC. Arlington AFC has yet to win in this competition, having lost its last 3 games. Kill Celtic lose to Monasterevin AFC. Monasterevin AFC despatched by BBC United. Arlington kept their unbeaten streak going this season as they came out on top of this tense local derby. The two newly promoted teams came up against each other for the first time in the premier division and again were separated by a single goal. Fortunately for Arlington, unlike the shield final they came out on top this time. A tense first half was really about both defences as they stood resolute against very few chances. Arlington edging it in terms of possession and chances created, the best chance falling to Conor McCarthy but his strike was just off target. The second half started brightly for the home team as they pressed high and forced Monasterevin to make sloppy passes. Arlington were rewarded for their dominance 10 minutes into the second half as a corner was half cleared and Jack Lennon finished into the bottom corner to get his second in as many games. Monasterevin had a few chances on the break but smart goalkeeping from captain Mikey Cunningham kept the score at 1-0. Arlington ran out the game comfortably with the home side unlucky not to add to their tally. Another fantastic team performance with Jack Lennon grabbing man of the match. Arlington remain 3rd with 7 points from 3 games. Mikey Cunningham(c), Jack Duffy, Emmanuel Ilori, Ben Slevin, Jake Nicholl, Tristan Dunne-Carroll, Cathal Bennett, Thomas Kenny, Jack Lennon, Darragh Galvin, Conor McCarthy. Subs: Ceilum Coughlan-Maher, Josh Maher, Patryk Sobczak, Ciaran Ward.